Who else, but GEX has the expertise needed to build a quality replacement VW diesel motor? These highly specialized motors are assembled by our own factory trained professionals and thoroughly tested to ensure peak performance for many years of trouble free driving. GX 10853X 1500 cc, 76-80 VW Rabbit, Dasher Diesel motors (no core), No longer available, must upgrade to 1600 cc below. Use GX 10853. What is a core charge ?? 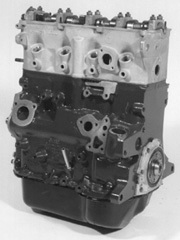 The Diesel long block motors come without the belt or front pulleys installed. Core charges are additional. Rebuildable cores may be returned freight prepaid to GEX for credit. All prices are F.O.B. Booneville, AR . U.S.A. and are subject to change without notice. Motors on this page do not include the flywheel. Why buy from GEX ?? Claim your free GEX T-Shirt with engine purchase. Check out our new EMPI store online for a complete listing of all of their air cooled Volkswagen performance parts for street & off road. and in no way are they used to infer or intend a direct connection between GEX International and Volkswagen AG or Volkswagen of America.